For more info contact the Public Works Department at (305) 365-8945. 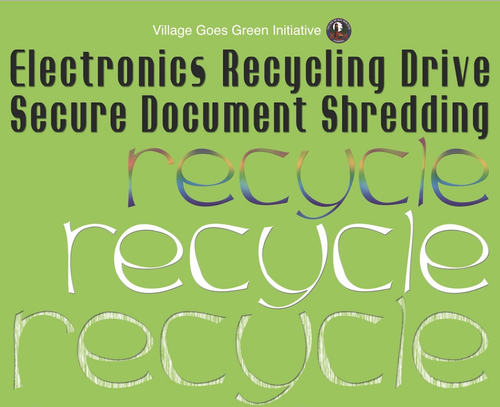 Residents (single-family homes, condos and apartments) and local business representatives are invited to participate in the 12th annual Electronics Recycling Drive (ERD). 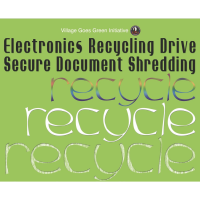 For the sixth year the Village is sponsoring a document shredding event at the same time as the ERD. A crew and mobile shredding truck from Shred-it will be nearby (along Village Green Way next to Village Hall) to offer secure shredding services for confidential documents. Shred-it's trucks contain cutting-edge proprietary paper shredding technology that safely process business or personal papers into confetti-sized pieces before being recycled. The Electronic Recycling drive-through drop-off location will be at the West Enid Drive on-street parking zone between the Village Hall parking lot and the Winn-Dixie building. You will see a tent and lift-gate truck belonging to EScrap, the Village vendor, between Village Green Way and Fernwood Road. The drop-off zone is designed for access from the east (i.e., from Crandon Boulevard or Village Green Way), and will be delineated with barricades and cones. Please refer to the lists below of acceptable and non-acceptable items. Small home electrics (ex: toasters, hair dryers) will be accepted as a service to residents but not recycled. Crewmembers will be glad to accompany residents to retrieve bulky/heavy items that cannot be delivered to the recycling drive location without help. These items can be recycled: Computers and peripherals: hard drives, main frames, laptops, keyboards, printers, scanners, cables, chargers, modems, hubs, PC and laptop batteries. CRT monitors (glass-bearing) Televisions (glass-bearing) Media players: VHS, DVD, CD, tape decks, audio receivers, MP3 players, iPods, chargers, cables Other electronics: Copiers, fax machines, telecommunication systems Land phones, cell phones, PDAs and chargers Mercury-bearing devices and batteries: Fluorescent lamps, ballasts, capacitors 4' lamps Over 4' lamps U-shaped and circular lamps UV-fluorescent lamps Neon lamps HID lamps HPS lamps Alkaline batteries (A3, AZ, C+D) Lead-acid batteries (car > dry or wet) Lithium batteries Non-lithium batteries: not to exceed 10 pounds Small household electrical equipment: irons, toasters, blenders, hair dryers, microwave ovens. Unacceptable items include: White goods; i.e., ranges, washers, dryers, dishwashers, refrigerators Tools Wood console TVs and projector TVs.